Thanks to Facebook, Twitter, Instagram and Snapchat, plus websites like YouTube and Vimeo, creating a digital version of yourself has never been easier. But what happens to all of that digital content when someone passes away? 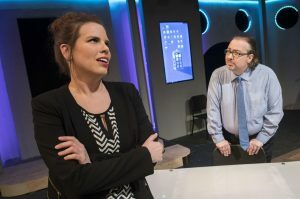 Playwright Jeffrey Jackson explores the idea of life after death via technology in “Two Point Oh,” which opens at Spokane Civic Theatre on Friday. The play takes place months after the death of software pioneer Elliot Leeds in a plane crash. His widow Melanie is still mourning when she finds her husband’s last, and perhaps greatest, creation, “Elliot 2.0,” a digital version of himself that he programmed with thousands of hours of recorded thoughts and speech. “Elliot 2.0” can answer questions, hold conversations, share memories and, time will tell, maybe even grow in intelligence. But is he alive? “Two Point Oh” stars Dalin Tipton as Elliot Leeds, Allison Peterson as Melanie Leeds, Benjamin Dyke as Ben Robbins, Julie Berghammer as Catherine Powell and Ron Ford as Jerry Gold. Director Chris Wooley was interested in staging “Two Point Oh” because he’s a fan of technical theater and was intrigued by the idea of a show in which the lead character only ever appears on screen. Early in the rehearsals, Wooley had Tipton stand onstage in place of the screen so the actors could look one another in the eye and build connections. Tipton and Peterson have also bonded during photo shoots with Wooley to create “archival footage” that will be displayed on screen throughout the show, including photos from the characters’ time in college and their wedding. “That way, when we put the screen there, they could still pull off of those memories and that emotion that we’d worked on,” Wooley said. The transition from acting with Tipton onstage to onscreen was easier than Peterson thought it would be thanks to that onstage work, though the atypical arrangement wasn’t without its challenges. To ensure quality audio and video during the show, Tipton will perform his scenes from a sound booth off stage. He will have a monitor with him so he can see the actors onstage. Because the show relies so heavily on technology, Wooley and the crew went through a lot of trial and error to make sure things run smoothly come showtime.